The 32-year old Verdi was taking a risk when he wrote Macbeth for the Teatro della Pergola in Florence in 1846. All of his operas until then had been grounded in fact or history, and indulging in the genere fantastico had its dangers, not least because at the time it was far from universally loved. In the event, however, the premieres were so warmly received that the Florentines soon awarded Verdi his own gold crown. Macbeth became the composer’s favourite of all his operas, and in 1865 he revised it to produce the version that’s still enjoyed today. Phyllida Lloyd’s 2002 production, revived here by Harry Fehr, never grounds the action in a specific century. The set consists of a large box-like area, with a back wall that frequently appears and disappears. When this wall is present, as in the scenes set in the Macbeths’ bed chamber, it creates a dark, repressive space that could almost pass for a contemporary hotel bedroom, giving the couple’s machinations a sense of ruthless modernity. The claustrophobic atmosphere also suggests that, once the Macbeths have started on their power hungry quest, there will be no hope of escape. It is no less telling that Macbeth’s crown is stored in a cage. The back wall comes away to create the forest where the witches dwell, or the castle where great pageantry takes place, all against the backdrop of a storm lit sky. That we witness ‘imaginary’ scenes such as the Show of Kings (bright golden men riding large golden horses) through a frame, help to make these scenes feel appropriately mystical. The sense of inevitability is also highlighted by having large set pieces played out in advance with miniature props, and by seeing the black robed, red turbaned witches aiding in the fulfilment of their own prophecies; when Banquo is killed, a witch helps his son to escape, while another actually presents Macduff’s children to Macbeth to be slaughtered. If the staging is effective, the singing is nothing short of glorious. Liudmyla Monastyrska must rank as one of the all-time great Lady Macbeths. As she sings her Act One aria, ‘Vieni! t’affretta!’, her rich, full-blooded vibrato exudes a calculating ruthlessness, her hands literally reaching out to seize the power of which she sings. If Shakespeare, and even Verdi, create some room for ambiguity concerning which of the pair is really the most ambitious, Monastyrska leaves us in no doubt at all. This does not mean, however, that Simon Keenlyside’s Macbeth is a mere vassal of his wife, and with impeccable richness and surety in his voice he creates a deeply multi-faceted figure. He is not merely a subservient husband, or an emotionally detached power seeker – or simply a deluded madman – but rather an intriguing combination of all three. As Banquo, Raymond Aceto’s voice is firm yet exciting, Dimitri Pittas’s Macduff excels in his Act Four aria, ‘Ah, la paterna mano’, while Steven Ebel is an effective Malcolm. In the pit, Antonio Pappano does wonders with Verdi’s rich and enigmatic score. After the murder of Duncan, Macbeth and Lady Macbeth’s duet contains moments that could almost be mistaken for an innocent love song, while the murder of Banquo is immediately followed by joyous coronation festivities (made all the more potent by his body remaining on stage). Pappano picks up on every nuance and innuendo in the music, so that the moments of silence within the Overture, between the scenes, and even within the arias themselves, carry just as much musicality as any note that is played. If this production is a strong one dramatically, musically it is something exceptional. Macbeth will be broadcast live at 450 cinemas around the world on 13 June 2011. 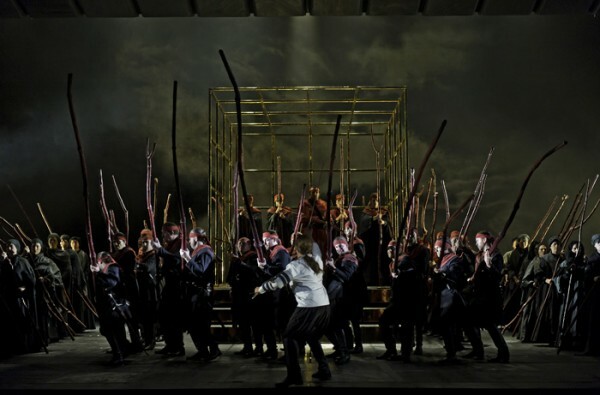 This production can also be heard on Radio 3 on 18 June 2011 at 6pm. For further details see the Royal Opera House website.